I wrote an article here a few years ago about grief and the holidays and specifically about Christmas time. Thanksgiving time can be a pretty hard time when you're grieving as well. 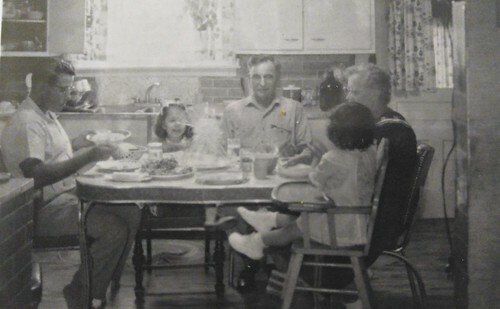 Long-time readers might remember that I grew up in a household with my mother, sister, grandparents and bachelor uncle. But there are other situations that can make Thanksgiving sad or even a little difficult. The first Thanksgiving after my only sibling's divorce was strange. After decades of celebrating together as two couples with lots of children as first cousins, we became an incomplete group. and the dynamic changed. 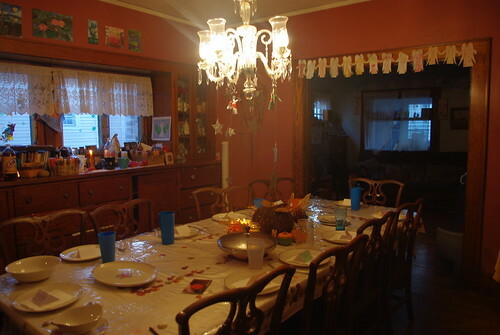 A couple of years ago too, my sister and I came to the determination that a big double family celebration was just more than we could handle any more - a pragmatic and sensible approach, but still a loss. One of the hardest things about Thanksgiving Day, and the Christmas holidays, is dealing with loss and grief. 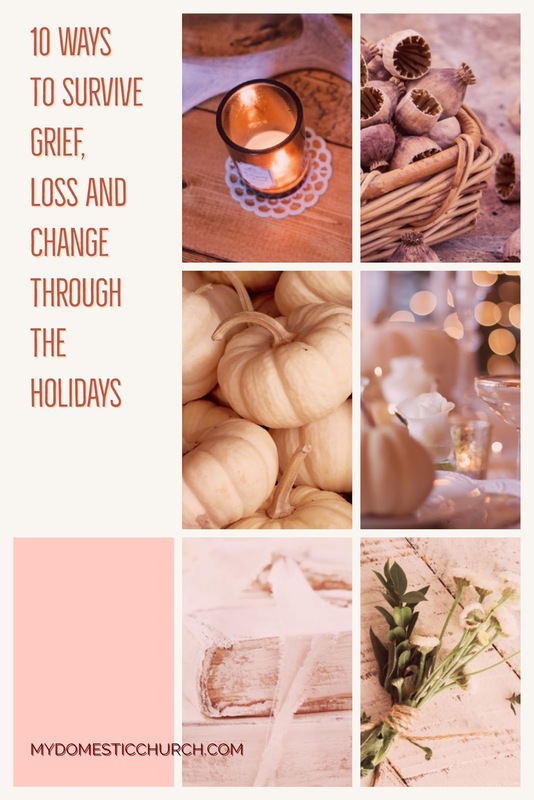 It's just difficult to be in the holiday season when you are still dealing with sadness over the death of a loved one, loss of a marriage or other changes in life that take us away from our traditions and ties to the past. But there are ways to make the holidays bearable and even pleasant. Here are some things that have worked for me in the past. 2. The same will be true for families after a divorce, or a serious illness, or for family with loved ones not able to be with them for the holidays. It's okay to be sad about that and to miss the familiar. 3. It sounds like a cliche but it's true - time really does take the sting of pain away. Not that it's ever gone all the way, but the intense, breath sucking sadness does fade with time - take hope in that. 4. Don't set anything in stone. Life changes. A lot. Be flexible enough to change with and enjoy each season for the blessings that come with it. 5. Make new traditions that include your deceased loved one if that helps. We have visited my baby's grave site every Christmas Eve since the year he died. We put little tea lights out, sprinkle the grave with glitter and sing Silent Night. It has become our ritual. Since 2009 we have included my mom's grave too. We aren't alone. The cemetery can be a beautiful place at Christmas time with wreaths and decorations. I found a lot of comfort and even cheer in seeing that. 6. But some changes are just really difficult to make. If your loss has been so great that you just feel numb and traumatized, there's no law against having a smaller Thanksgiving celebration - maybe go out to eat instead of fixing a big spread, or maybe just a simple meal at home surrounded by things and people that are comforting. Maybe this is the year to just be quiet, be still and just let your body and spirit feel soothed. 7. Or really change it up. 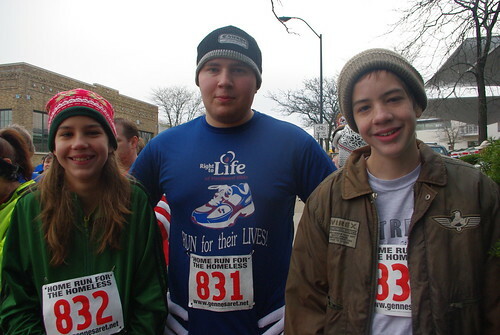 A few years ago my kids ran a race for the homeless on Turkey Day. It was a totally different kind of Thanksgiving Day than I ever remembered - it was fun and it was for a good cause. One year we helped out with Mobile Meals and that was a great way to change things up as well. 8. A loss is a loss. You can't pretend it didn't happen nor should you. Find a way to memorialize a lost loved one, either through a special prayer (A very Catholic thing to do in November anyway!) or visit the cemetery to put down some flowers, light a candle, or maybe write a letter, play some special music. 9. Find something special for THIS Thanksgiving. Maybe it is going out to see the Christmas lights, or maybe a family hike, take pictures, or buy something special for the table, or something nice to wear or perhaps to give to someone less fortunate. Make this Thanksgiving Day count for what it is and celebrate it for that. 10. Don't forget to offer a prayer of Thanksgiving. No matter how bad it gets, there is always something to be thankful for. Life itself is a gift.